Special Assistant to the Secretary, Ginnie Mae: Special Assistant to the Secretary detailed over to the President and Executive Vice President at the Government National Mortgage Association (GNMA) otherwise known as Ginnie Mae; Serve as direct Assistant to The Secretary of Housing and Urban Development, Dr. Ben Carson; White House Advance Volunteer: Organized and executed political and official events in support of the President of the United States; 58th Presidential Inaugural Committee Site Coordinator: Working on logistics and production of all public and private events regarding the inauguration of President Elect Trump as the 45th President of the United States. Specifically worked on Lincoln Memorial Welcome Concert. Ran Operations and logistics of all area for public in non ticketed area at Lincoln Memorial Welcome Concert (150,000 patrons) 17th street and ww2 memorial to east end of the reflecting pool and Henry Bacon Drive; Donald J. Trump for President, Inc. Advance Site Representative: Traveled Nationally throughout course of campaign. 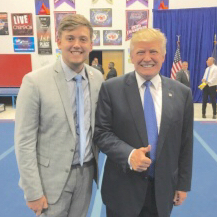 Worked as a Site representative for the Trump Campaign Advance Team. Specialized in Managing and logistical oversight of rallies, fundraisers, and RON (Room Over Night) and any and all movements of the candidate to create a smooth course of events for the schedule. Managed and coordinated with Secret Service and local law enforcement agencies and related entities to arrange logistics for a secure event. Coordinated motorcade arrangements at each campaign stop. Responsible for routinely coordinating rallies for 10,000+ people in less than 72 hours turnaround time. 58th Presidential Inaugural Committee I served as an event coordinator for the 58th PIC and worked mainly as an integral part of the "Make America Great Again Welcome Concert" at the Lincoln Memorial. Donald J. Trump For President INC I served as an Advance Site Representative on the Campaign Advance Team. I routinely aided in executing the campaign rallies. Do you know something about Austin Browning? Send us an email at [email protected] or send a Signal message to 347-244-2134.